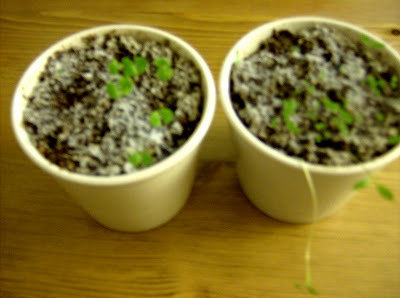 Single Girl Gourmet: Herb garden update! This is the best my herbs have ever done! *knock on wood* I've been moving them around the apartment like crazy trying to catch any of the fleeting winter sunlight coming in my apartment. I have been continually thwarted by rainy weather but at least they are growing. Slowly. At this rate, I will be able to use them by...July. But as long as they don't die I'm happy. I'm a little concerned that the soil is growing some kind of mossy-mold, anyone have experience with this? I don't think I'm watering them too much, I think I've only watered them 2-3 times since I planted the seeds. Perhaps my apartment in just that hummid because of all the rain we've been getting in DC, any ideas anyone? Bannerizer made it easy for you to promote ClickBank products with banners, simply visit Bannerizer, and get the banner codes for your selected ClickBank products or use the Universal ClickBank Banner Rotator to promote all of the available ClickBank products. International breakfast - Not IHOP! Simple scalloped potatoes - from Japan?